1940 League For Friendly Service TB Charity Seal, full gum, F, MNH. Issued 1940 by the League for Friendly Service, Bloomfield, NJ. 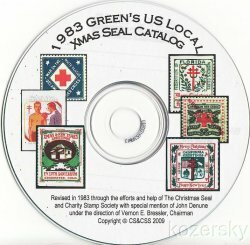 Green's Catalog #2-815, multicolored seal. 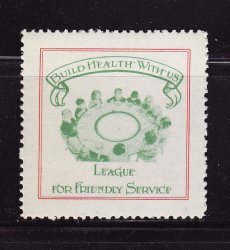 1940 League For Friendly Service TB Charity Seal, full gum, F, MNH. Issued 1940 by the League for Friendly Service, Bloomfield, NJ. Greens Catalog #2-815, multicolored seal. Seal is 30.5 mm sq., perf. 12. Image of children seated around a large circular table. Across the top of the seal on a ribbon, the words "Build Health With Us" name at bottom, all in green, within a double red border.